BREAKING: Humpty Dumpty Sat on the Wall….. This is the most appalling information I have seen with regard to our Hancock County Library Director, Courtney Thomas. To deliberately and publicly lie to a public body as they deliberate the future of the entity that she manages is beyond the pale, and I am calling for her to immediately submit her resignation to the Hancock County Library Board of Trustees. She does not possess the educational requirements set forth by the Miss. 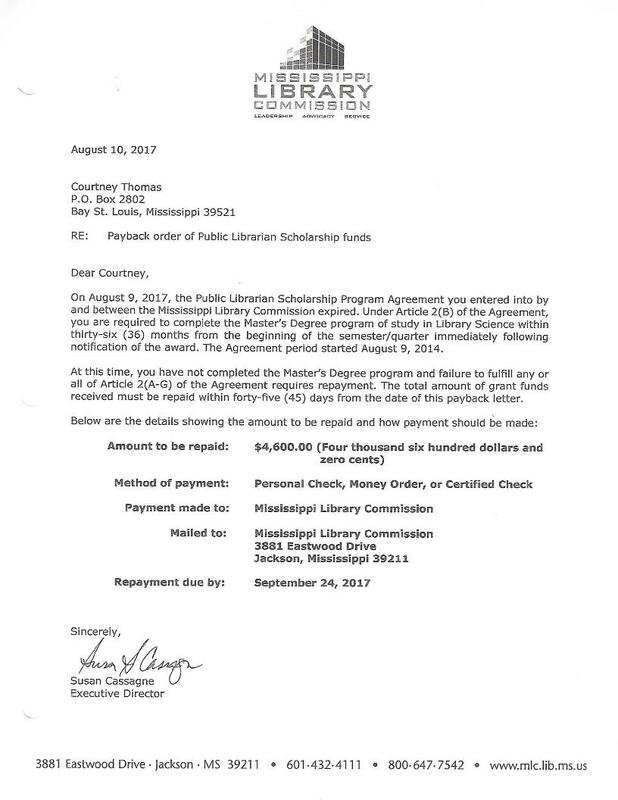 Library Commission for the position of Director, neglected to take advantage of the “gift” of $10,000 to secure those credentials, and is now on public record lying to one of the entities who financially supports the library and her compensation. I would seriously doubt the Library Board has the statutory authority to continue to compensate her as Director. This behavior, in my opinion, eliminates her from the privilege of handling one penny of public money. AND, if the current Board of Trustees of our Library System in Hancock County was aware of this, they need to resign with her. Yarborough would have to check that out. Quicker just to comply with the Miss. Library Commission action of March 28, of this year when they ruled all Library Directors in service areas greater than 15,000 residents must carry a Master’s degree– according to the Commission, our local Library Board has to find a new Director with the required credentials. Why should every other county in the state with over 15,000 residents have to comply with this ruling, and not Hancock County??!! “ASK’ Ms. Thomas to walk??!! She HAS to walk for our Library System to be in compliance with the regulations of the Mississippi Library Commission dated March 28, 2017. Period. And the Library Board needn’t file a waiver for he either. That is definitely not an option since she has had over 2 years to notify the Commission if she could not fulfill her part of the grant agreement, and didn’t do it. Note in her letter to Thomas, Commission Executive Director, Susan Cassagne, informed her of her failure to fulfill Article 2 of the Grant Agreement. Our Director is out of options, and our Board should act accordingly and swiftly. This isn’t about being right. It’s about doing right!! Unbeliveable not only should Ms. Thomas go but the whole Library Board should go. Mr. David & Ms Lana: where is Ms. Rachael, Mr. Trent & Mr. Gary, our Government attorneys? Shouldn’t they be advising “Houston we have a problem” with taxpayers monies? “You all need to request an inquiry of proper usage of finds immediately? Attorneys for us must be the protectors of Government bodies decisions of tax monies….. freeze um and let State boards take a look. The entities they represent have to authorize them to do so. I am confident it is forthcoming from at least one of them. According to the echo article no one has acknowledged this very inappropriate situation yet. Could be lag time. I say let the county single source fund it then we all have a singular voice. County folks get way more for the tax dollar than us city people in the Library funds. We pay more property tax and they get more benefit from it. This is misuse of public funds. Misleading the funding entities. The list from legal to moral to ethical questions are everywhere! WOW. Imagine that. And another reason why I moved from Hancock County. If the Bay council gives them our money after we already pay county taxes, they should be ashamed. I wonder how much of their personal money they donate to the library? Just because they are non profit and operate under presumed benevolence they are still just representing their pay check. Where are her hand selected board of directors cover ups? It is my understanding the Library runs the filings through the chamber. Does the chamber verify anything or just take the money and run and blindly file their nonprofit status for them. They all need a thorough audit cleansing. Where is the legal council for the library? There are more questions than answers. They need to be put in time out until the questions are answered. Did they falsify the E&O Insurance and does the board have this coverage to pay back the system for paying her with no statutory authority to do so. Were they advised, did they know etccccc. This looks like a ridiculous uproar about a small issue. Why? Is there some kind of personal beef that Ms. Noonan has against the librarian? Before we lock Ms. Thomas in the library and burn it to the ground, maybe we should ask a couple of basic questions. 1. Is she doing a good job? This is a woman who graduated as valedictorian of her high school. She graduated at the too of her class in college and could have gone anywhere, but chose to return home. She is dedicated to her community. Is the community really better off if you run her out? 2. Why hasn’t she completed her Masters? Is it that she been working 50+ hours per week and hasn’t been able to find the time to commit to the classes without taking away from her job? In that case, maybe the 36 months isn’t realistic and should be extended. 3. Even without the Masters degree is she involved in other continuing education? Does she belong to organizations that promote amd support her knowledge in library science? My final question is why so much venom? Why does it seem like it is always the same kind of people at the head of the mob with pitchforks? Why are reasonable people so afraid to chime in and say enough is enough? Ms. Thomas is your neighbor and a committed lifelong advocate for education and literacy for the people in Hancock County. That should mean something. Rather than taking perverse satisfaction in publicly condemning her, wouldn’t everyone benefit by a reasonable conversation about how to address this issues and move on? If we can’t even be decent to the people who are our friends and neighbors, then God help us all. The rest of the coast doesn’t call this place “Hancock Parish” for nothing. It is State Law! The left thinks State Law and Federal Law or only suggestions if it goes against their wants! It seems to me the masses reached out and gave her a golden gift to continue down her chosen field. if she did not take benefit of it or legitimately rescind from it that responsibility lays with her. As well, she told the public officials in a public meeting she was in fact in the program to get her Masters, which the tax payers were supportive of in a gift of $10,000 to get qualified. Don’t spin it any other way. Many people reach this dilemma in their respective careers. Some can pull it off others can’t. What ever the reason the only charge here is that she is not qualified. She started the liberal slant that politicians were bullying her when in fact she was bullying them. Fact is she wanted a hand picked board and that just raises eyebrows as to why. We suspect that hiding this little faux pas was one of them. Respect the taxpayer and their representatives when you are on a dole out system. Not sure this is a liberal or conservative issue moreso than simply a classic example of a glass house dweller that is fond of throwing stones. Not more than a month ago I witnessed Thomas questioning Vicki Arnold’s qualifications to serve on the school board. Turns out she isn’t qualified for her own job. To quote Ms. Thomas’ mother Joan, “pure trash”. The left? What?? I see a couple people keep suggesting that Ms. Thomas working as the library director is illegal. Where are you getting this? I read the statute which says that the library director has to meet the state qualifications. So I went to see the state qualifications. Which you can find here if you are interested in truth as oppossed to mean spirited gossip, http://directorguide.lib.ms.us/category/personnel/guide-recruit-pld/. That is a guideline which SUGGESTS, not requires, that the director have a Masters in library science. If not they need to obtain a waiver. So even without a Masters degree, qualified people, like Me. Thomas, can serve as director. Unless there is some other secret guideline, this is the ruke with respect to library director qualifications. And according to the statute and this guideline it isn’t illegal for Ms. Thomas to be the Library Director as a few people on this site seem to be suggesting. But don’t take my word for it, even though I am an attorney who has been practicing law for the past 20 years, read the dang guideline yourself! What is the big deal if the Board gets a waiver to give her more time to finish the last classes needed for her master’s degree? It isn’t a big deal, except maybe to people who have an axe to grind and don’t care about how it affects the rest of the community. Would you mind sharing with the rest of us where you practice law and what firm you are with? We have been listening to her blistering comments on our elected representatives as they try to fairly represent the tax payer and she lives in a glass house! Everyone was on to let her get in the masters program she on her own defaulted that ain’t a crime but she needs to be evaluated on her reasons and why she didn’t get this clarified up front when she scolded the elected officials on bullying and have a hand picked board. Maybe you feel the mayor should hand pick the council? To have a class one Library you must first meet all the professional guidelines set for by the Library Commission. It does this to prevent political hacks from getting these jobs. I would hope she is not one of them. Blistering comments makes a fair point. Ms. Thomas reasons for why she is still a few classes shy of her Masters should be evaluated on merit, not based on the fact that she has been critical of politicians. I understand that sometimes people get caught up in the frenzy of the witch hunt. But seriously, we are talking about a really smart and dedicated woman who is a few classes short of getting her Masters degree on time. Do you really think the community is better off without her service? I was at a complete loss to appreciate why a few people seemed so outraged that the librarian didn’t have her Masters degree yet. Then I saw the comments about glass houses and rocks and her calling out politicians. I just wonder which one leaked the information and twisted the facts to mislead people into thinking she wasn’t qualified for her job. I think people are smart enough to see through that. I hope so at least. With all due respect, Ms. Thomas did not agree to be “just shy” of her Master’s on August 9, 2017, in her agreement with the Library Commission. She signed agreeing to be a Mastered Degreed Librarian by that date, and to notify the Commission if her circumstances changed and she could not fulfill her obligation. The facts here have not been twisted. They have been verified through the University of Southern Miss. and the Miss. Library Commission, neither of whom I would believe are interested in misleading anyone. Susan Cassagne was straightforward with Ms. Thomas in her payback demand letter on behalf of the Commission. After listening to her question a school board nomonie and hearing her boast of her accomplishments I would not have even thought she might bite her finger nails much less default on an educational grant made just for her situation to make her qualified and the tax payer paid for it! Come on lots of problems her. I take public financial interest very seriously and this was of her creation and her failure to be forth right with the Library Commission, The Elected Officials that represent us, the Payor she the payee! Some people are concerned with getting taxpayer funds and the other 75% are worried about how and who it is spent! Politicians did not do this the Library Director did! Politicians don’t really ever do the home work necessary to make a decision on these types of things. They appoint boards who are often too caught up in the accolades and internal politics to honestly over sight the entity the are charged with. Concerned citizens are typically the ones that do the due diligence to open up transparency! Just as in this case. Everything mentioned has been of public record. You can run but not hide in todays world. If you work off of public funds you will be subject to public scrutiny! Get used to it! Ahh! VENOM!!! That’s what our community has witnessed at far too many public meetings coming from Ms. Thomas and her ” supporters” towards every public official in their line of fire for the past 6 months. My Mayor in Waveland had to call her down at our meeting 2 weeks ago for accusations towards the Board of Supervisors that he deemed out of line. Spewing venom is a sacrament for some folks until they get a little back. Then it’s an outrage. 39-3-17-Section (2) (1) ” There shall be one library Director for each library system. Said library system Director shall have the educational qualifications as prescribed by the Mississippi Library Commission.” The Miss. Library Commission voted unanimously on March 28, 2017, that all Directors of systems with a service area of more than 15,000 residents to have a Master’s Degree. This is not a “suggestion.” The Miss. Legislature has authorized the Miss. Library Commission to set these standards, period. Every other County and library director in our state has to abide by this. Why is Ms. Thomas and Hancock County different? Is that the position Ms. Thomas and Ms. Cotie have chosen to defend? Have at it, ladies. By the way, no one posting on this issue has suggested that Ms. Thomas be fired from the Library System in Hancock County. We are simply saying our Library Board has to comply with state law, which now prohibits her from being the Director. Perhaps there is an opening at another level in the System that does not require even a Bachelor’s in Library Science. Remember, she also does not have those credentials according to USM. Ms. Cotie has declared here today that Ms. Thomas graduated at the top of her class at Bay High and the University of Southern Miss. That is quite an accomplishment, and I would like to publicly congratulate her here. But are we being asked to believe that someone of this caliber, at the age of 42, could not comprehend the terms of an agreement on an educational grant she signed?! Ms Cotie is now saying that 36 months was not long enough to finish the Master’s and Ms. Thomas was working long hours. Ms. Thomas had the opportunity to contact the Commission with all of this as per Article 5, Section C of the grant agreement she signed, had 36 months to do it, and didn’t. I would venture to guess the vast majority of those posting here financially support the Hancock County Library System through their tax dollars, and their names can actually be found on the Hancock County Tax Collector’s ad valorem directory. We have an investment here, and respectfully disagree with Ms. Cotie’s description of this as” a small issue.” It is also an enigma as to why Ms. Thomas would not want our Library System to meet the requirement of the Commission and Legislature and have a Master Degreed Director. She certainly gave that impression when she accepted the $10,000 grant for that express purpose. In closing, Ms. Thomas had every opportunity to look at Ward 4 Councilman, Larry Smith, at the Bay St. Louis City Council meeting last week and reply honestly to his question, “Are you still in the Master’s program?” She chose another route, and the taxpayers that compensate her do not have to condone it.